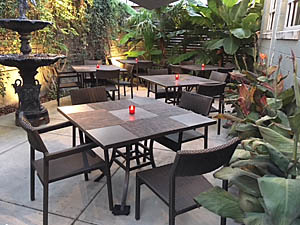 If you want a fine dining experience for lunch, Undercurrent Restaurant is an excellent choice. 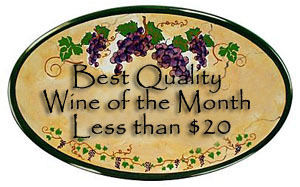 It offers everything you could want for a lovely experience at an affordable price and you leave looking forward to a return visit. 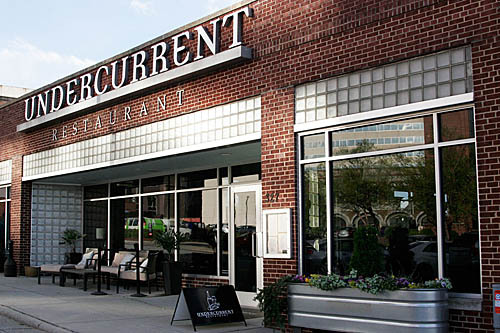 Offering a tasty variety of dishes from soups to salads, sandwiches, and entrees, Undercurrent Restaurant is a an outstanding place for a casual lunch with friends, a business lunch, or a special occasion celebration with a crowd. Ray and I went for lunch because we had had an excellent wine pairing dinner there and were eager to see if the lunch measured up; it did! 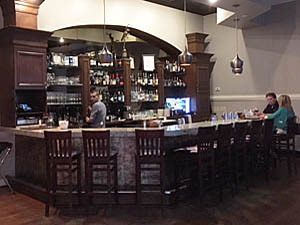 We were greeted by one of the owners and passed by the elegant bar on our way the the dinning room. The large open kitchen gave us a peak at the activity behind the scenes and in summer we would like to try the patio for dining al fresco. But it was a cold winter day and we were seated at a table for two in the dinning room which filled up by the time we left. 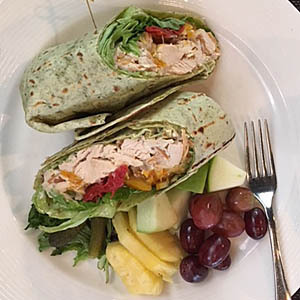 I chose the almond chicken wrap ($11.00) that included lettuce, tomato, orange marmalade, red onion, and balsamic mayonnaise. 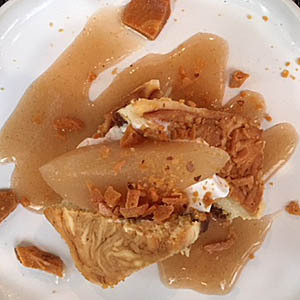 It was a sweet blend of flavors with the orange marmalade highlighting the copious amount of tender chicken. I bypassed the french fries and potato salad and instead chose the fresh fruit offering that included pineapple, green apple, and red grapes. 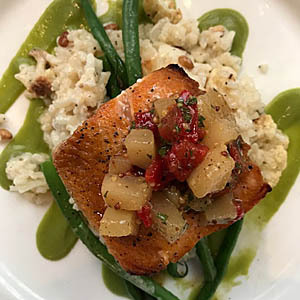 Ray chose the seared salmon entree ($16.00) that came with roasted cauliflower-pine nut risotto, French beans, red pepper-pear mostarda, and basil-white truffle puree. The salmon was perfectly cooked, the risotto combined just the right amount of creaminess with a tender bite, and the basil white truffle puree was the high light of the dish with its unique flavor. We ordered a bottle of 2016 La Torretta, Delle Venezie Pinot Grigio ($27.00) that was crisp and fruity and a very good pairing. 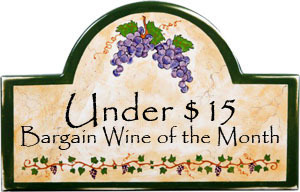 Undercurrent has a reasonably priced and expansive wine list that includes a large selection of wines by the glass and half bottles. For dessert we shared a very delicious caramelized orange cheesecake ($9.00) served with a Madeira poached pear slice, and candied marcona almonds. We enjoyed a glass of Blandy’s 5-year Bual Madeira ($10) with the cheesecake that was good although we prefer D’Oliveira Madeira, but the Blandy’s Bual was the only Madeira available. 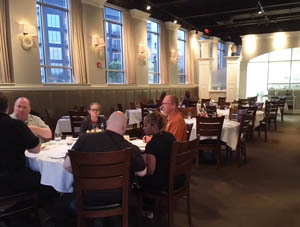 The ambiance of Undercurrent Restaurant is peaceful and serene, the acoustics are good so there is little background noise even with a big family party going on near us, the service is prompt and efficient, and the food is delicious and a bit out of the ordinary. 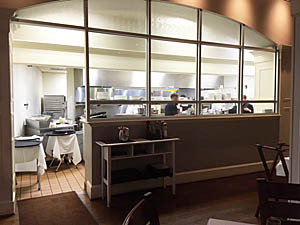 We could not ask for more and consider this a top notch dinning experience! The Undercurrent Restaurant is open for lunch Monday-Friday 11:30-2, for dinner Monday and Wednesday 5:30-9, Thursday-Saturday 5:30-9:30, and for brunch Sunday 11-until.